Wait, Who's Eating Tide Pods? Recently there have been several news reports about teenagers eating laundry detergent for fun. If you’re confused by this, don’t be alarmed! This post is here to help. They’re little packets of liquid laundry detergent, favored by lazy college students or anyone who doesn’t want to lug a full container of detergent to their laundromat. Why would anyone eat them? Well, not long after Tide pods launched in 2012, reports surfaced that small children were trying to eat the pods or play with them because they looked like candy. Reportedly the pods were sending an average of one child a day to the hospital in 2012 or 2013. Seniors with dementia or cognitive impairment were also accidentally eating the pods, which resulted in several deaths. Did Tide do anything to stop people from eating their shiny, delicious-looking pods? Yes, Tide redesigned their pod bags with a child protection zip and launched an entire ad campaign on how to protect your kids from eating them. Okay, so just to be clear, babies and senior citizens with dementia are the only people eating the pods? According to AAPCC data, in 2016 and 2017, poison control centers handled thirty-nine and fifty-three cases of intentional exposures, respectively, among thirteen to nineteen year olds. In the first fifteen days of 2018 alone, centers have already handled thirty-nine such intentional cases among the same age demographic. Ingestion accounted for ninety-one percent of these reported exposures. Why are teenagers doing this, other than the fact that they’re stupid? In December, a bunch of people started posting memes about eating Tide pods on Twitter. I do love a good meme! Me too! But the meme was just the tip of the iceberg. In early January people started posting videos of them doing the “Tide Pod Challenge,” in the vein of other stunts like “the Cinnamon Challenge” or the “Ice Bucket Challenge.” A few of the videos were misleading on purpose, with people tricking viewers into thinking they would eat them. But some teenagers actually did post videos of them breaking into Tide pods with their teeth, many of them getting flagged by Youtube and the site actually started removing the videos. 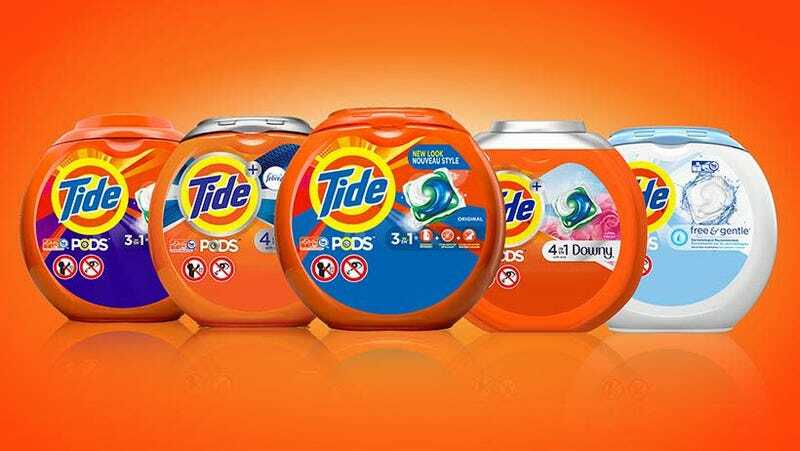 “We are deeply concerned about conversations related to intentional and improper use of liquid laundry pacs and have been working with leading social media networks to remove harmful content that is not consistent with their policies,” a representative for Tide said. Don’t be caught eating a Tide pod in 2018. Not just because they are extremely dangerous to your health and potentially deadly, but also because Tide pods are over. Done. Finished. I really think normal, edible food is going to make a huge comeback soon.